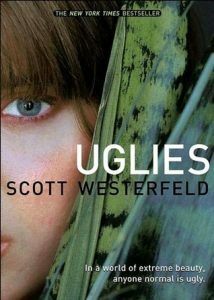 If you like the Uglies series, check out these other post-apocolyptic and future world titles. On a futuristic island paradise where humans are served by enslaved clones, a sixteen-year-old clone named Elysia seeks her own freedom. Girls, called "Eves", are raised in schools and trained in the arts of pleasing men until they come of age. Freida and Isabel are best friends. Now, aged sixteen and in their final year, they expect to be selected as companions - wives to powerful men. The alternative is life as a concubine or living in chastity, is too horrible to contemplate. But as the intensity of final year takes hold, the pressure to be perfect mounts. Isabel starts to self-destruct, putting her beauty - her only asset - in peril. Sixteen-year-old America Singer is living in the caste-divided nation of Illea, which formed after the war that destroyed the United States. America is chosen to compete in the Selection - a contest to see which girl can win the heart of Illea's prince - but all she really wants is a chance for a future with her secret love, Aspen, who is a caste below her. View more suggestions for the Uglies series.